A couple of years ago I produced a short video titled, “How I Trade Breakouts“. Have a look at it first if interested. In that video I discussed the fact that I don’t like to trade breakouts. My preference is to trade the first pullback following the breakout. That’s self-explanatory. As an alternative I also mentioned that I will aim to get in before the point of breakout, if I perceive a potential for a breakout to occur. 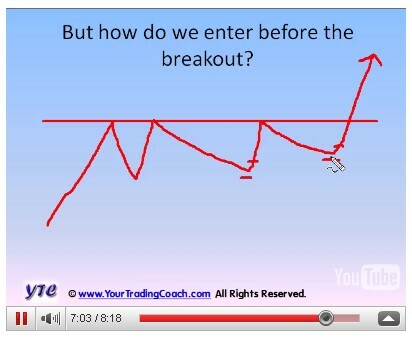 The following is a screen capture of an image in the video, demonstrating how a pullback prior to breakout can be used as an entry in the breakout direction, when our assessment is for a high likelihood of breakout. Such an entry should only be taken if the distance to the resistance (or support) area offers sufficient room to scalp a small profit, or scratch for breakeven, should the resistance (or support) level hold. 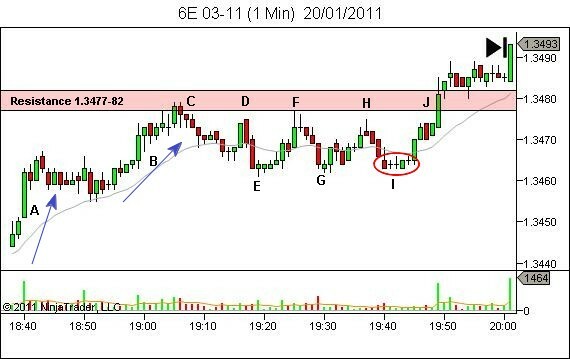 The following chart is the Euro on January 20th, 2011. It’s a one minute chart, which is what I currently use as my trading timeframe, but the concept is relevant to any timeframe or market you wish to trade. You’ll observe that an utprend was in play through swings A and B, right into the area of resistance (1.3477-1.3482) at point C.
Subsequent attempts to breach the resistance area occurred at D, F and H, before the eventual break at J. My expectation on initial approach to the resistance area was for a test of resistance to hold, due to reducing momentum between swings A and B and a slowing of momentum within price swing B itself (YTC Price Action Trader’s – note this is an application of the Fifth Principle). The test of resistance occurred at C, offering a short trade from resistance. Further price action would be required though, to determine whether the market would set up for an additional attempt to break resistance, or reverse to a downtrend. The increased bearish strength of the move from D to E, set my expectations briefly for a reversal. However that bearish pressure failed to continue lower, offering a complex pullback entry long from E for another test at F.
Subsequent attempts to push lower (F-G and H-I) were similarly unable to continue lower. Buying was occurring in the vicinity of the 1.3460 level. Despite the apparent strength of each downward swing, the failure to continue lower adjusts my expectation for future price action. A simple principle which often applies in price action analysis is, “If the market cannot move in a particular direction, it will quite likely move in the opposite direction”. The pullback to point I offered a really nice stall with an easy opportunity for entry long, in anticipation of a possible eventual breakout. Trade management in such a case should consider taking partial profits in the vicinity of the resistance area, with the remainder having a stop moved to breakeven in the event of further failure. In this case, the stop was not threatened and price broke to higher levels. Recognition of the failure to continue lower from resistance, has allowed us to position ourselves in the breakout direction, prior to the point of breakout. Key point: “If the market cannot move in a particular direction, it will quite likely move in the opposite direction”. I’ve been reading your e-book and every posts here. Thank you for your work. In this posts, I wonder why we don’t think that unability to continue higher after D-F-H area test is a sign that price will going lower, then we find an short entry? Instead you anticipate price will break out eventually. I try to keep the articles from diverging away from the primary aim of the article. In this case the article was written with the sole aim of discussing entry prior to a breakout; the breakout being of the D-F-H region with the ideal entry being lower at I. However there is absolutely no problem as well with your idea of looking for shorts due to difficulty in breaching the resistance area. You absolutely should be. The idea though, if following the same concept of the article, would be to seek entry short in the vicinity of D, F or H, rather than a break of E, G or I. At least I don’t think wrong about ” if price can not go higher after trying 3 times, price will go lower. “. I even think that I’ll wait for a reversal.